Appledog wrote: Hunyuan Qigong #1 "Jiang Qi Xi Zhang" aka sink qi to wash the organs. 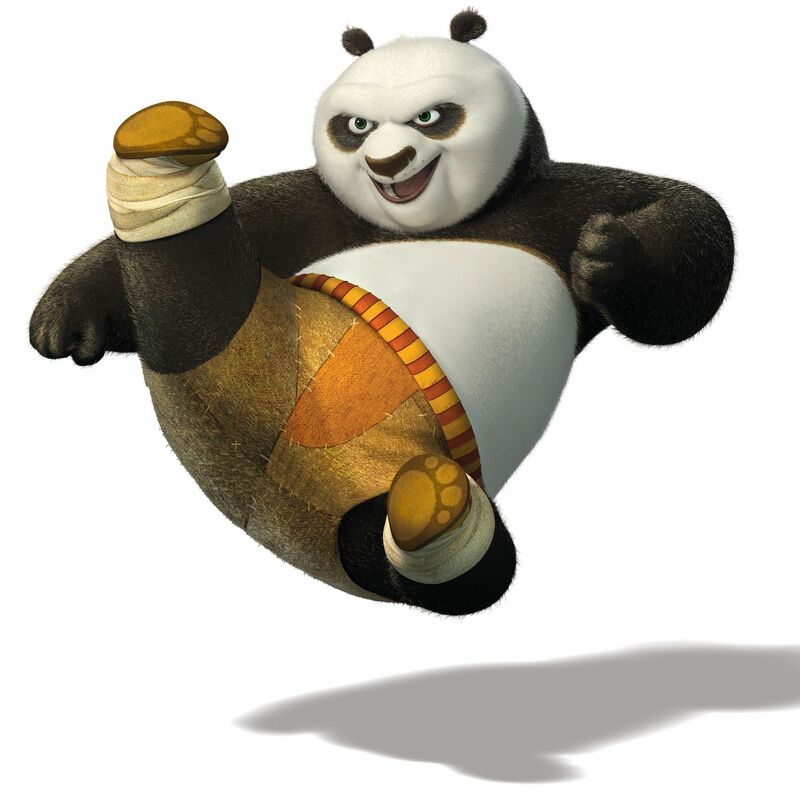 It's a common move in the internal arts, you will find it and similar-purpose moves in Taichi, Xingyi and Bagua, ex. 0:24 in https://www.youtube.com/watch?v=uP5OEjYVzKQ shows the move used to start a Xingyi form. The exterior shape of the movement is similar to the Xingyi form movement you posted, but probably the intent is not. It certainly is not the same as the others you posted prior to editing your post, such as the Taiji posture white crane, etc. 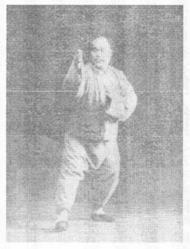 A video showing an older version of Feng's exercise is here, shown by Zhang Xuexin, a long-time student of Feng's. It better shows the (original) intent of the exercise. As Feng aged, things changed. I don't want to hijack the thread, but did want to comment on that. Last edited by charles on Fri Feb 01, 2019 9:16 am, edited 1 time in total. Steve James wrote: Although, I can't specifically recall seeing any pictures of YCF doing the "holding the ball" pose, I'd expect it to look something like this. 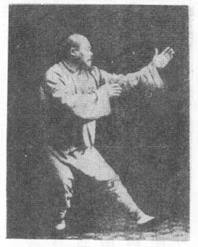 Chen Yanlin's Taijiquan manual has a section on stance training and he discusses three postures. Not too far from holding the ball. I used to train 9 basic "holdin` the ball" postures in mabu stance. I started from 9 breaths per posture, /average 20 minutes training/, and stretched it to the classical 36 breaths = 90 minutes workout/. However, later I found out, that "hangi` on the tree" J.W.`s style is more beneficial . More bang for the buck in shorter time, I mean. I really have to try it. Not sure if I'll get very far. My brother can do an ok human flag hold. hanging on the tree is very hard to keep, I had BIG problems with starting "hanging" in this position . When I reach length of 10 breaths /per one side/ , hoho, was very proud . just ` ~~10 breaths + with leg stretching on the front and back no more than 30 -40 breaths per side, total. for work with gymnastic staff fully you need specific /"light"/ body construction . Last edited by wiesiek on Mon Feb 11, 2019 4:18 am, edited 1 time in total. The single leg 'hold the ball' is presented in Kuo Lien Yings TCC Book as The Universal Post. Last edited by cloudz on Mon Feb 11, 2019 5:03 am, edited 1 time in total. charles wrote: The exterior shape of the movement is similar to the Xingyi form movement you posted, but probably the intent is not. It certainly is not the same as the others you posted prior to editing your post, such as the Taiji posture white crane, etc. No that's great thanks for posting that, it all adds to the pot I'm stirring. 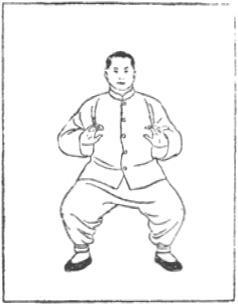 I do think there is a direct relation between the early daoyin, tree hugging, and basic forms of moving qigong like what is shown in Feng's system. It's figuring out how you get from one to the other (and why) which fascinates me so much about this.